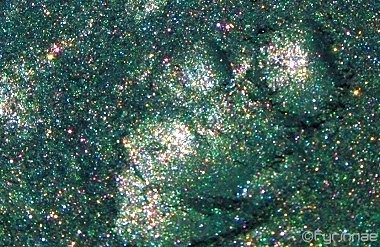 Lush shimmering emerald green, filled with a rainbow of sparkle, like in Shenanigans and Scarlet Macaw. Otters are quite enchanting, are they not? Endangered 2012. Not lip-safe. Swatch applied over regular primer. Pixie Epoxy or other adhesive base is recommended to keep sparkle in place, but not necessary for vibrant color.